Climbers are often reluctant to go further afield and try new areas of climbing. The guidebooks are often confusing (and expensive), the crags are difficult to find and route finding can be especially challenging. Which is why our organised UK climbing trips and Rock Climbing Abroad trips are so popular. Monsterclimbs are offering new 3 day courses in the UK in North Wales, The Lake District, Pembrokeshire and Cornwall. Having good local knowledge and experience in more challenging environments is one of the advantages of using a qualified Instructor. 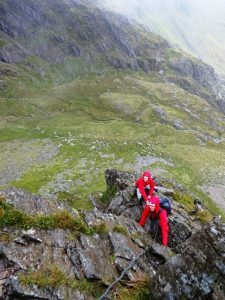 Scrambling in North Wales is a great way to develop navigation skills as well as moving on steep terrain and can make a day on the hill a little more exciting. This 3 day trip will include hands free scrambles to steep terrain and some rope work. 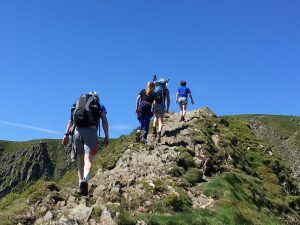 Venues would include Tryfan, Cwm Idwal and Crib Goch, Clients can decide how much they want to learn and the difficulty of the challenge – from easier steep ground, to short roping and doing mini pitches. All equipment will be provided and group sizes will be small. You will need waterproofs and decent walking shoes or boots as well as a Rucksack for spare clothes, water and food. Prior experience is not essential but you will need to be relatively fit. Accommodation, travel and food is not included in the cost. Camping or bed & breakfast is widely available in Llanberris/capel Curig – Snowdonia. Scrambling in The Lake District is a great way to develop navigation skills as well as moving on steep terrain and can make a day on the hill a little more exciting. This 3 day trip will include hands free scrambles to steep terrain and some rope work. Venues would include Striding Edge, Swirral Edge, Sharp Edge and Jack’s Rake. Clients can decide how much they want to learn and the difficulty of the challenge – from easier steep ground, to short roping and doing mini pitches. All equipment will be provided and group sizes will be small. You will need waterproofs and decent walking shoes or boots as well as a Rucksack for spare clothes, water and food. Prior experience is not essential but you will need to be relatively fit. Accommodation, travel and food is not included in the cost. Camping or bed & breakfast is widely available in Patterdale and Great Langdale in The Lake Distict. 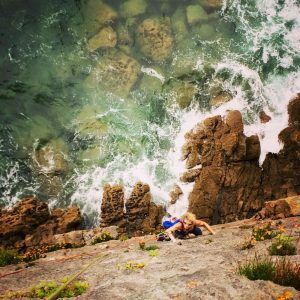 Sea Cliff climbing in Pembrokeshire is designed for climbers who already have some experience of trad lead climbing. Clients would learn how to: identify routes from above the cliffs, set up abseils – ensuring an escape route is in place, learn how to prussik which will enable you to escape from zorns or sea cliffs, learn how to use tide timetables and be aware of sea conditions and how the weather can change abruptly. Your comfort zone will be challenged. Salt water can have a very detrimental affect on gear, particularly fixed gear – bolts and pegs should always be backed up and slings checked thoroughly before using. If your personal gear gets wet it does need to be rinsed in lukewarm water with a mild detergent which is then rinsed off, dried thoroughly and cam lube used on any camming devices. 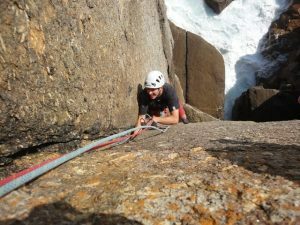 Sea Cliff climbing in Cornwall is designed for climbers who already have some experience of trad lead climbing. Clients would learn how to: identify routes from above the cliffs, set up abseils – ensuring an escape route is in place, learn how to prussik, learn how to use tide timetables and be aware of sea conditions and how the weather can change abruptly. Your comfort zone will be challenged. Venues would include Bosigran, Sennen and Chair Ladder. Cost does not include travel, accommodation or food. B& B and campsites available in St. Just and Sennen and throughout the West Penwith area. 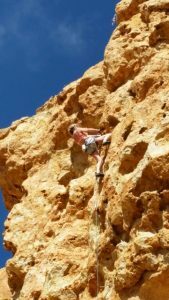 Monsterclimbs offers climbing experiences in more and more areas of the World – Spain, Tenerife, Sardinia, Kalymnos, Morocco to name but a few. Sport Lead Courses are designed to scrutinise your climbing in great detail to improve safety, efficiency and technique including lead belaying, leading and clipping, route reading and movement. You will certainly improve your confidence and may even improve your climbing grade. Climbing in Spain is one of the best ways to improve your sport climbing technique and grade. The weather is pretty reliable; warm and sunny which is perfect shorts and t-shirt weather. This means your muscles warm up quicker, you get lots of Vitamin D and any aches and pains you have tend to disappear in the warmth of the Mediterranean sun. Clients must have some prior experience of sport lead climbing, their own harness, shoes, chalk bag, belay device and helmet. Quick draws and ropes will be supplied. country of origin. The courses will run throughout the months of October and November 2018. 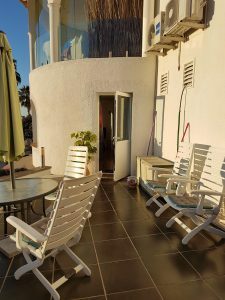 The holiday will be based near Calpe, in self catering apartments in the quiet foothills nearby within a 10 minute drive of Calpe or if you prefer in the heart of Calpe with good shopping, restaurants and cafe facilities. There is also a lovely beach adjacent to the town. The climbing is in the Costa Blanca guide book. See posts for further information and pictures. Venues include The Penon, Sierra de Toix, Pena Roja, Gandia, Alcalali and Sella. rock types, even though the island is volcanic. Crag locations vary from dry river gorges, to hillside crags to those in the crater of El Teide. The holiday would be based in one of the Mountain villages in a self catering apartment on the south east side of the Island, Venues would include El Rio, Arico, La Guaria, Los Naranjos and El Teide. Maximum of 4 people – £600 per person. Price includes accommodation, 5 days of instruction and transfers to and from Tenerife South airport and to all crags. Clients must arrange and pay for their own flights from their country of origin. Courses are arranged by personal enquiry only. 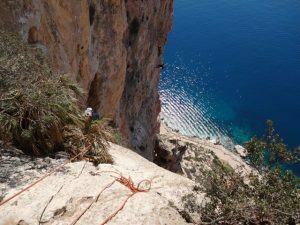 Sardinia, off the coast of Italy and to the south of Corsica is one of the most beautiful and rewarding climbing areas in Europe. The countryside is unspoilt and the towns and villages have the character of old Spain with very few high rise buildings but lots of variety of style, colour and orientation. When Ali first visited the island there were few major roads, but with the construction of motorways in the interior it is much easier to get around. It is just as easy to fly to Cagliari as it is to Alghero. There is sport climbing all over the island and varies in intensity. There are short inland crags, huge sea cliffs often with many pitches and impressive mountain crags that take all day to complete. All the routes are bolted in Sardinia, but the climbers who put up the routes have to supply the bolts, there is no ‘bolt fund’ and as a result they are often 25 – 30 feet apart on some of the bigger multi-pitch climbs which makes for a great deal of excitement, so it is quite useful to take a small rack of nuts and cams for those moments when the run out is just that little bit too big and your nerves have been strung out too long. It is a climbing venue that suits most abilities and for the intermediate sport climber who is developing grade and technique it is perfect. The Cala Gonone area is particularly enticing with 13 different crags in Cala Gonone itself and a further 10 crags in the near vicinity. The best months of the year to climb are April and October, the winter months are too cold – it even snows here and the summer months are way too hot. All courses in Sardinia will take place in April. Cala Gonone is quite a busy little town with many bars, restaurants and shops, and Dorgali which is just over the hill has a good climbing shop. You will be staying in comfortable self catering apartments in Cala Gonone within walking distance of local amenities. 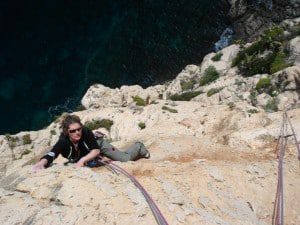 If you would like to book a place on the Sardinia sport climbing holiday, or have any questions or queries fill in your contact details on the events page, and Ali will get back to you as soon as possible. Maximum of 4 people – £600 per person. Price includes accommodation, 5 days of instruction and transfers to and from Alghero airport as well as transport to the climbing venues . Clients must arrange and pay for their own flights from their country of origin. different culture than European destinations. You must have good experience of trad lead climbing as this is a serious and challenging environment. Monsterclimbs will teach you how to be safe in this environment and control the risks as much as possible. Even in October and February the temperature can soar and dehydration becomes a serious possibility – you must carry at least twice your normal amount of water. The pitches are long – often 60m, so ensure you bring plenty of quickdraws with you and a few extra nuts and cams. Sun bleached slings and lower offs are a frequent hazard and extra rope or leaver slings and karabiners should be carried at all times. Holidays are based at Kasbah Tizourgane, £500 per person – minimum 1 person, maximum 2 people. Price includes 5 days instruction, transfers from the airport and to the crags. 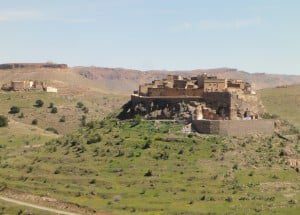 Clients must arrange and pay for their own flights from their country of origin and accommodation at Kasbah Tizourgane. Courses available by personal enquiry only.